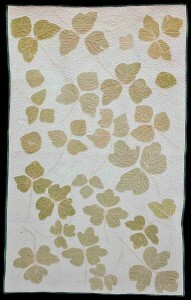 Bettye Kimbrell pounded kudzu leaves to make this wall-hanging. 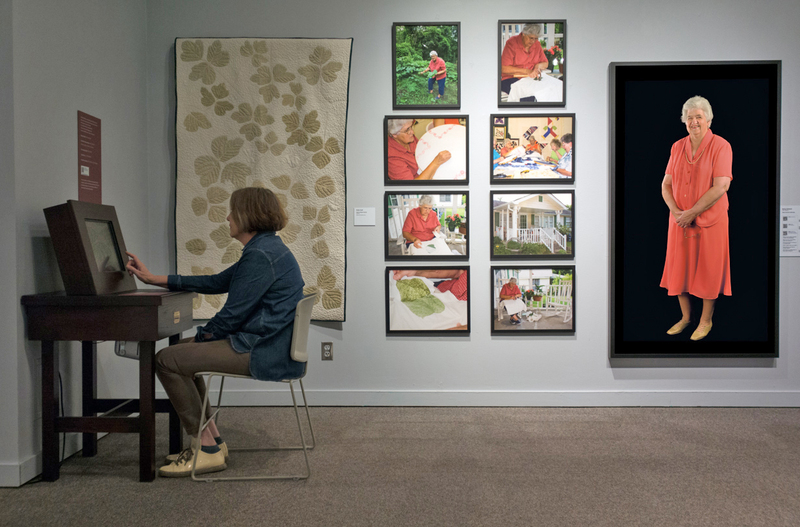 Photo by Alan Govenar, courtesy of Documentary Arts. Bettye Kimbrell created this wall-hanging for Alan Govenar, president of Documentary Arts, an organization which assisted the National Endowment for the Arts in presenting the 2008 National Heritage fellows on stage at the Strathmore Music Center in Bethesda, MD. When Govenar visited her in Mt. 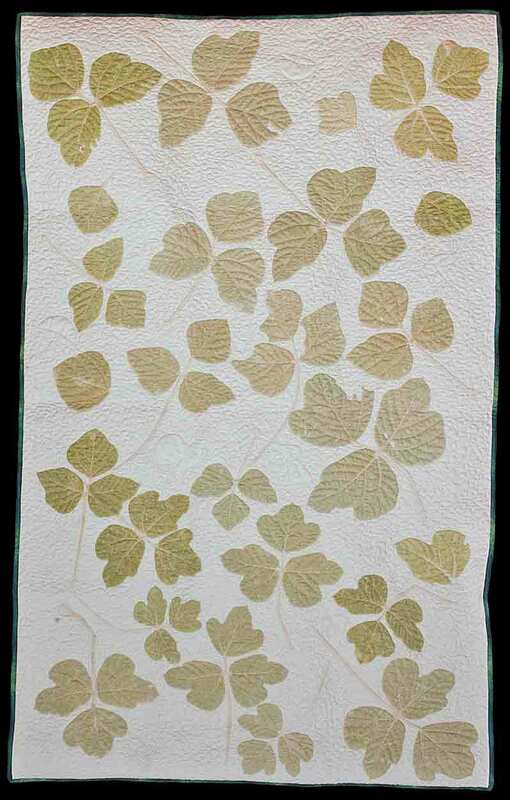 Olive before the event, he requested that she make a quilt for an upcoming touring exhibit and suggested that it feature kudzu leaves. 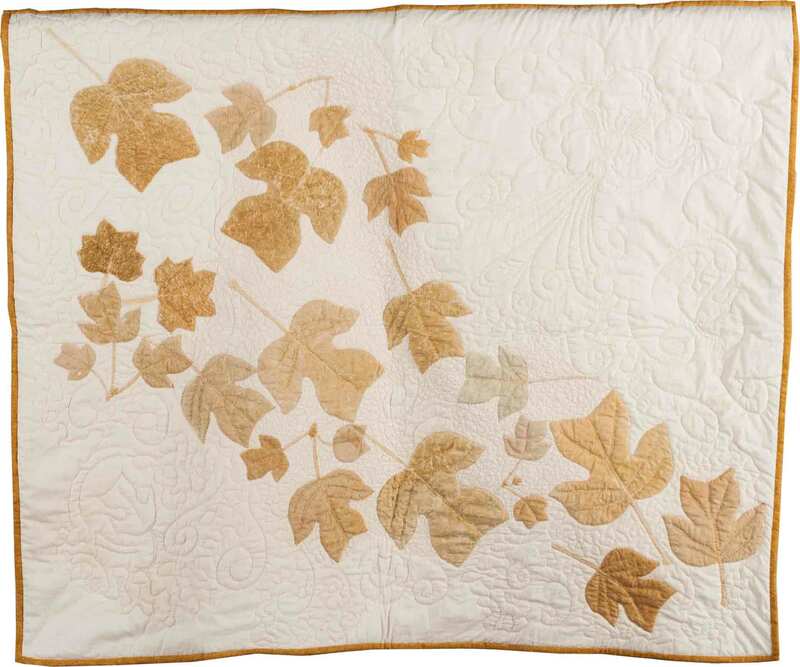 When she agreed he scrambled down a nearby ravine to gather the kudzu she would need for the project. 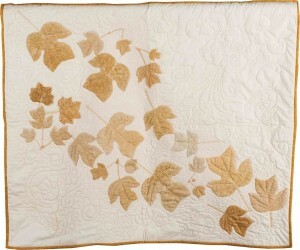 Bettye did not fill the background with meandering stitches as intensely as she usually did because of the deadline for the piece, yet it is a fine example of Cherokee leaf pounding and a memorial to the smothering vine which is trying its best to cover the south. 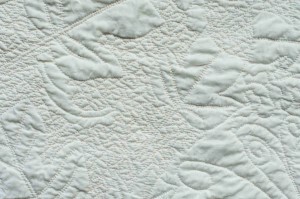 The quilt has been viewed in Paris and five cities in Belgium and now is included in Extraordinary Ordinary People: American Masters of Traditional Art. This exhibit is described as “a journey across America through the lives of individuals whose creativity is rooted in their cultural identity and community.” It features numerous art forms and cultural groups that contribute to the vibrancy of American life, including Byzantine (Greek) icon woodcarving, Peruvian retablos (personal altars), Native American basketry, Eastern European lacemaking, and quiltmaking, as well as musical and performing traditions. 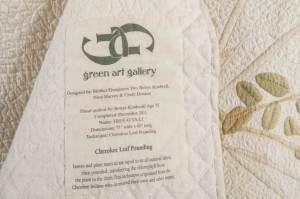 It has been displayed at Michigan State University Museum (East Lansing), Castellani Art Museum (Niagra, NY), and other sites across the nation. 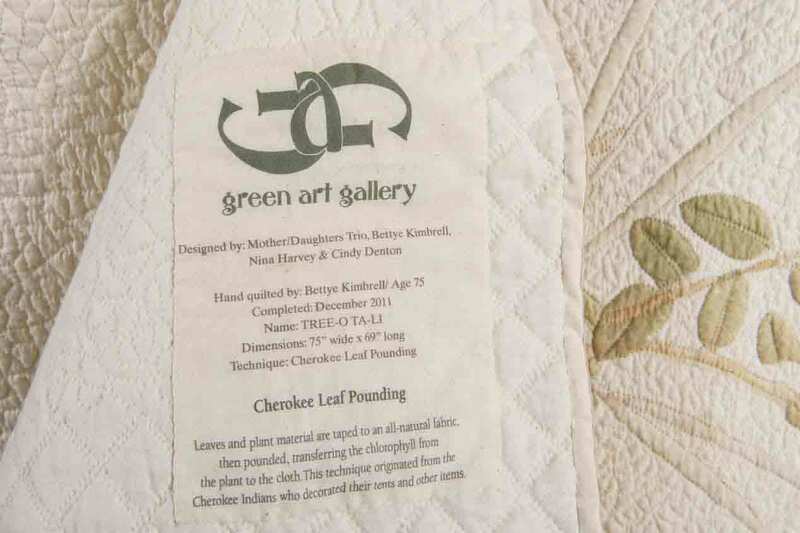 For more information about the exhibit and specific tour dates visit Documentary Arts. Bettye Kimbrell wanted her quilts to be as beautiful on the back as they are on the front. 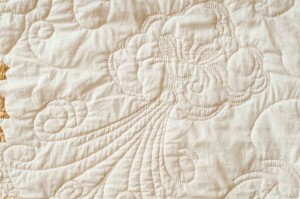 Those who turn her pieces over will see no knots, tangles or holes. 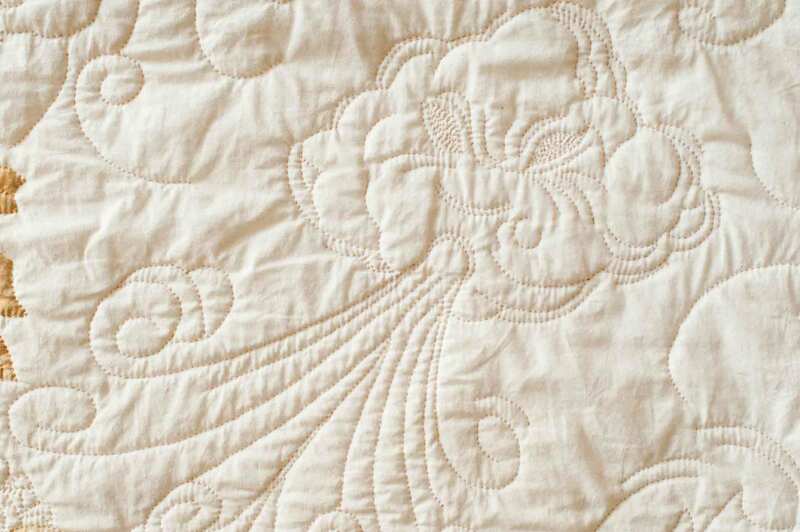 Because of this aim she devised a time-consuming method of stuffing her trapunto pieces from the top rather than the back to avoid placing holes in the back that would need to be repaired. 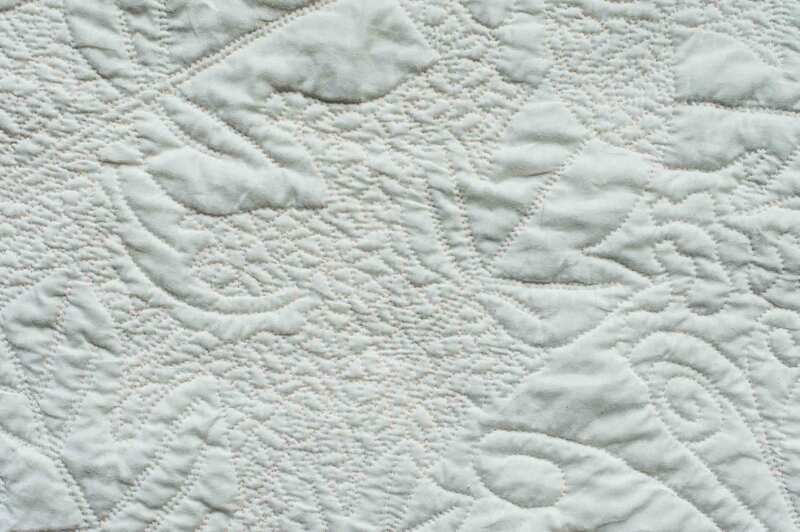 Except for the label and rod pocket she put on the back, her whole-cloth quilts look much the same on both sides, as you will see in the detail below. 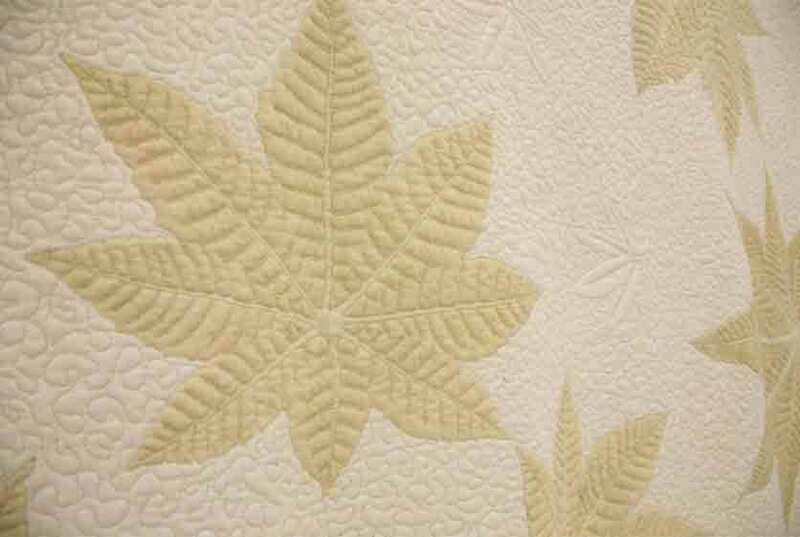 When Bettye and her daughters Nina Harvey, a floral designer, and Cindy Denton, a graphic designer, met together to work on a quilt they called themselves a “tree-o,” since their quilts usually involved some pounding of tree leaves. 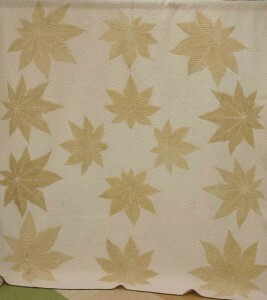 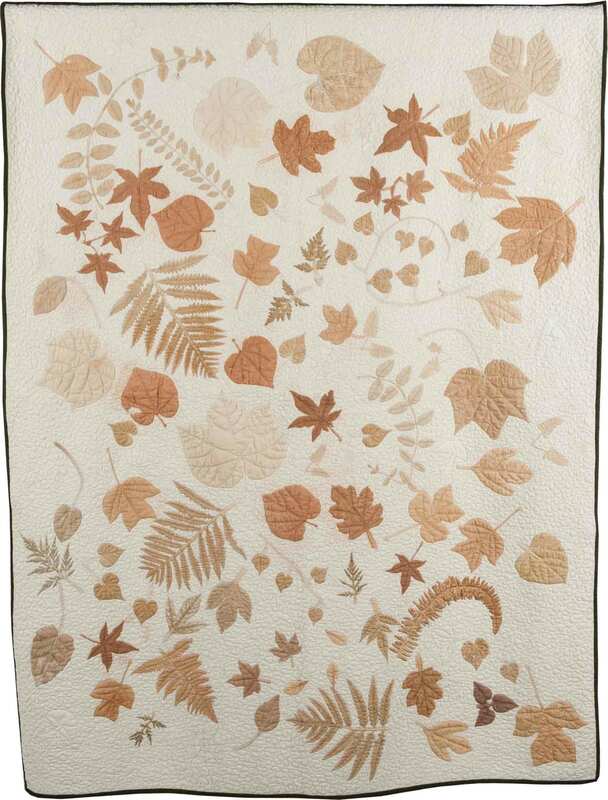 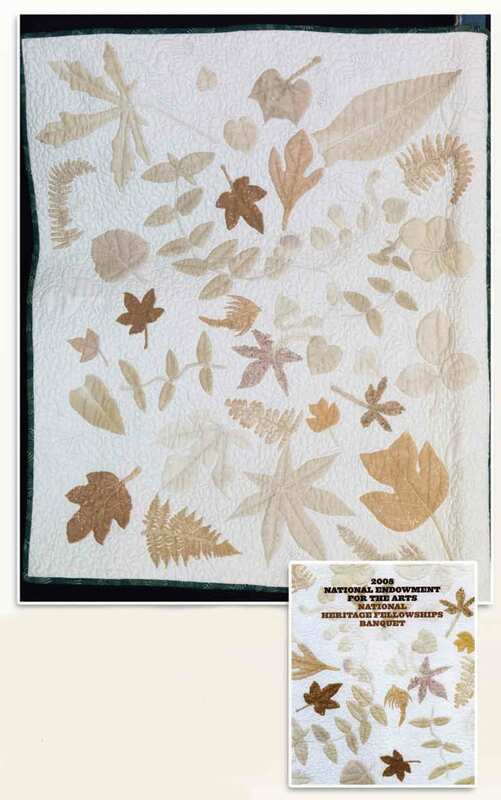 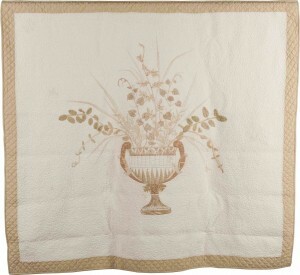 This being the second Cherokee leaf pounding quilt they designed together, they used the Cherokee word “tali,” meaning “two,” hence the name “Tree-o Ta-li.” This quilt is different from other leaf-pounding quilts Bettye did because she and her daughters used the leaves to provide different colors for individual pieces of a design they had drawn on the quilt top. 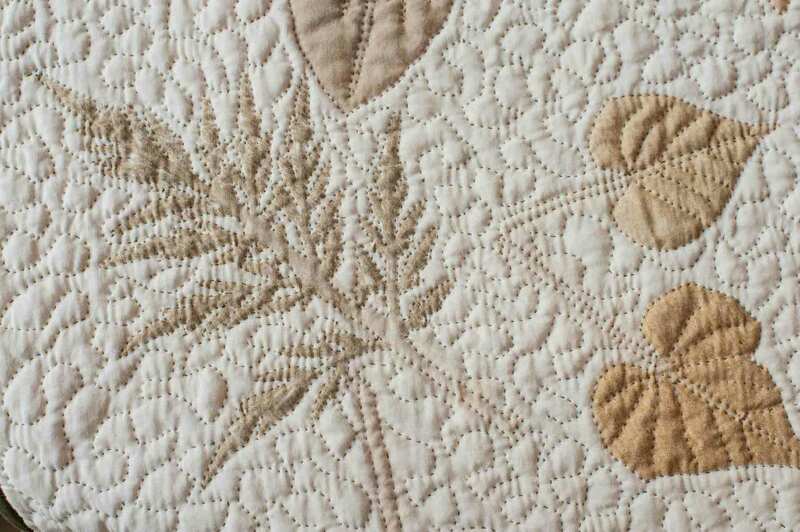 Instead of pounding the entire leaf to create its shape, they carefully pounded parts of the leaf to color the small circles that surround the top of the urn, all the zigzags, meanders and border designs on that object. 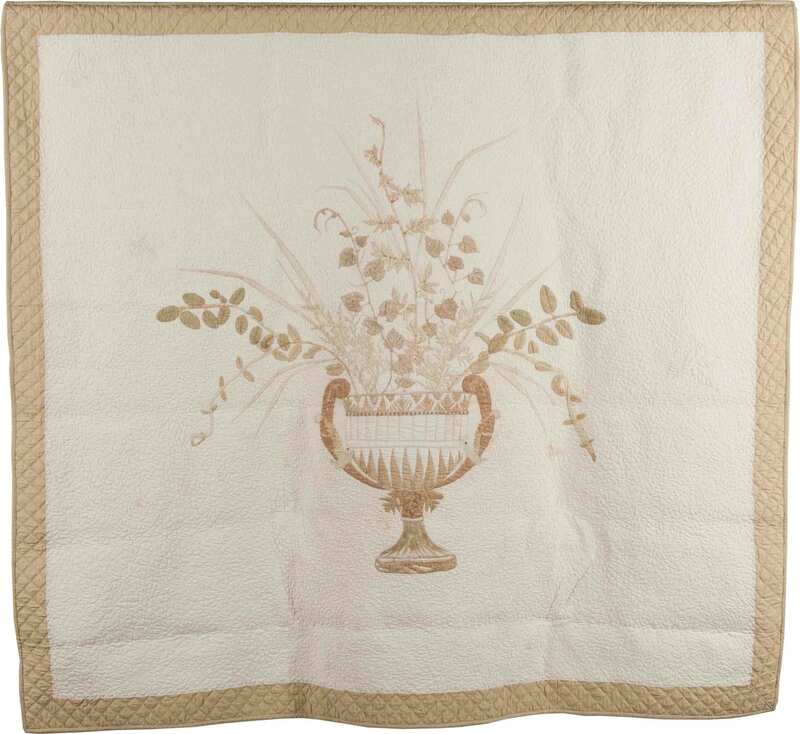 as well as the stems of some of the leaves, grasses and vines that arise from the urn and arch over its sides. 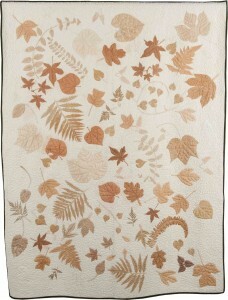 This quilt is now part of Merrill Stewart’s collection. 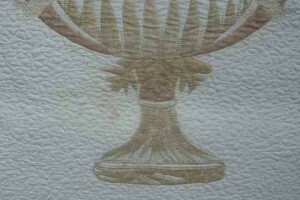 (Photos by Don Breland, courtesy of Merrill Stewart).